Influencer marketing is becoming an increasingly popular strategy for businesses and it has its roots in advocacy and public relations. Essentially, the idea is to work with people who are really famous within an industry, creating an affinity with them for your brand and reaching the audience that the celebrity attracts. But many business owners mistakenly believe that simply convincing somebody famous to talk about their brands will make their company famous too. But the reality is that in today’s social media-centred world, more and more people feel empowered to follow their passions, create content, and gather a following, giving anybody the opportunity to be influential in their own way. Bear in mind that it isn’t just A-listers who can be influencers for your brand. You don’t need to get movie stars and chart-ranking pop singers to talk about your company; it could be a regular guy who has a few thousand followers on his hobby blog, an Instagram user with a high number of followers, or even your customers who are always advocating for you and spreading the word about the brand they’re so satisfied with. Today’s social media platforms such as YouTube, Snapchat, and Instagram are home to a whole group of people who are known as creators. They may not be household names, but they do have various levels of celebrity within their respective industries, and many have large followings on these platforms. And if you’re paying to play, there are marketplaces where you can pay for a tweet, Instagram image, YouTube review, etc., from these people. It’s often a good place to get started and get a feel for how the strategy works. On the other hand, many brands who want to use influencer marketing seriously as a long-term strategy over time will focus on building meaningful relationships with experts in their industry. When it comes to the true leaders and experts in your niche, you will find a lot of common ground when it comes to the things that your audience really cares about. While working with the well-known names in your industry, don’t forget that often, your loyal customers can be the biggest influencers of all. It’s no surprise that many brands today are offering referral programs, giving customers the chance to earn something back in return such as a free item, service or credit towards their next purchase when they influence somebody else to shop with the brand. After all, the people closest to you tend to have the biggest influence on your choices so encourage your customers to spread the word to their families and friends. It’s important to clearly outline the goals that you’re hoping to achieve with influencer marketing. Will you be paying to play, or would you rather build long-term, mutually beneficial relationships? What do you expect to get out of your relationships with influencers? Will your influencers be celebrities, industry experts or both? Influencer content can play a vital role at any point during the buying cycle, whether it’s simply creating awareness or encouraging a transaction. 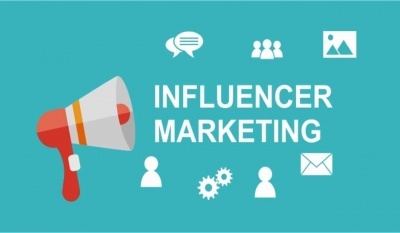 Any marketing goals that your company has can also be applied to influencer marketing.